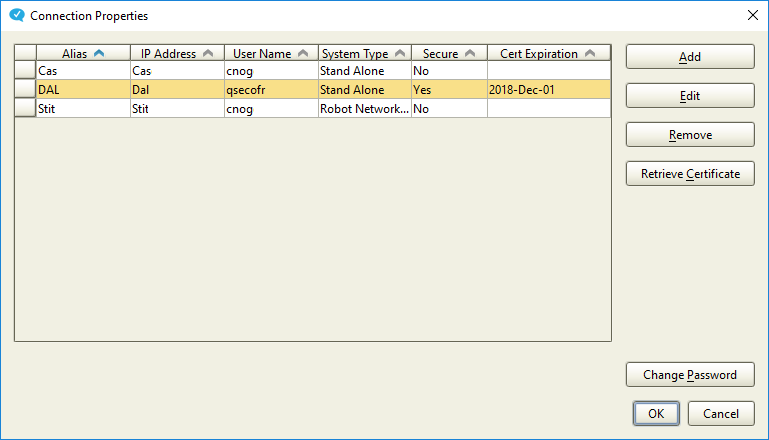 The Secure Connection GUI functionality has been added to the following products: Robot Schedule, Robot Schedule Enterprise, Robot Console, Robot Network, and Robot Space. 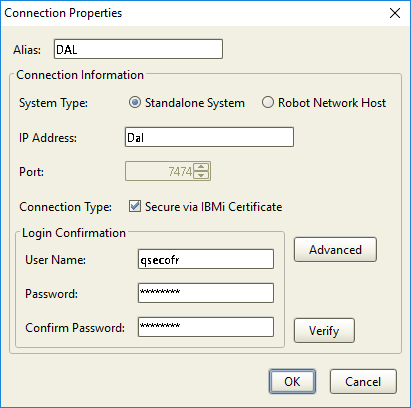 The Secure Connection GUI functionality only imports existing certificates from the IBM i for use in the Robot software. Beyond this importing function there are no certificate management features. For further information on certificates, see IBM Support, or your Certificate Authority (CA) provider of choice, or speak to your system administrator. Self-signed certificates and 3rd party Certificate Authority (CA) certificates, both system specific and domain level, will work with the Robot software. All seven IBMi ports are expected to be secured with the same certificate. 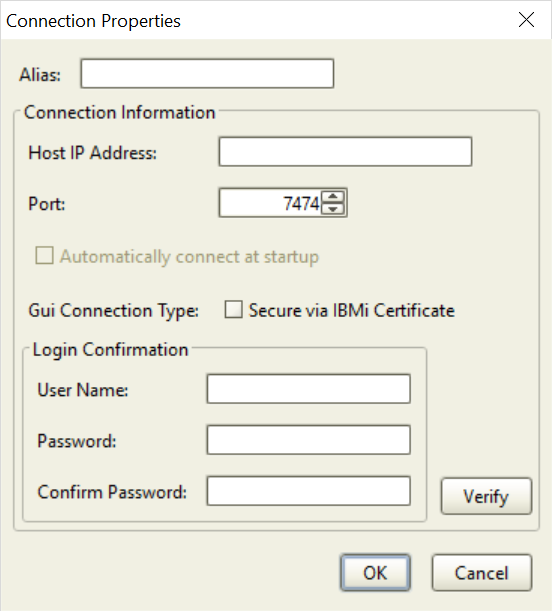 For a list of the seven ports on the IBMi that are required to be secured, see IBM i Secured Ports. If you are using secure connection for Robot Schedule in standalone mode, you must be at version 13 AND if you have Robot Schedule Enterprise, that must be at version 2. Also, if you have Robot Console, that must be at version 7. If you are using secure connection for Robot Schedule in host mode, Robert Network Host must be at version 12, Robot Schedule at version 13, and if you have Robot Schedule Enterprise, you must be at version 2. Users of Secure Robot products may wish to change the default passphrase for the certificate store ‘jssecacerts’. Once you have changed the password you will need to update the ‘jssepassphrase’ file on the system where the certificate store password was changed. You can specify the new passphrase you wish to use and the encrypted passphrase will be saved in a file called ‘jssepassphrase’ in the “/Help Systems” directory on the IBM i and in the “C:\Program Files (x86)\Help Systems” folder on the PC. Open a command prompt using the “Run as administrator” option. 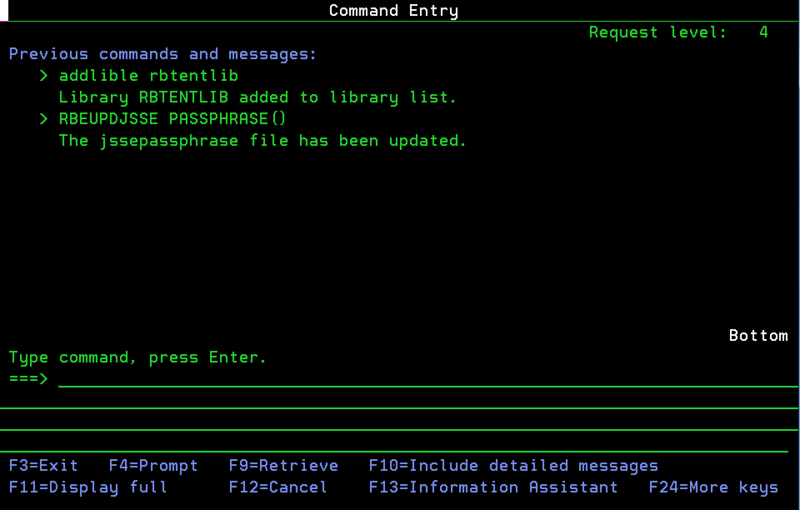 NOTE: The command must be run with an administrator level profile. Change directory to either the Robot Schedule or Robot Console folder. Example: cd “C:\Program Files (x86)\Help Systems\Robot SCHEDULE 13”. Enter the command: updatePassPhrase save <new passphrase> NOTE: Depending on the new passphrase entered, it may need to be surrounded by double quotes (“pass phrase”). Press Enter. The passphrase will be changed and the jssepassphrase file will be created. NOTE: The new passphrase is case sensitive and does not need to be surrounded by quotes. Enter Command RBEUPDJSSE and prompt with <F4>. Enter the new passphrase and press Enter. Enter the command 'RBTNETNODE/RBNCFGNODE' and prompt with F4. On the system where Enterprise Server is installed, add the library 'RBTENTLIB'. Enter the command 'RBECONFIG' and press F4 to prompt. Change the 'Use Secure Connections' parameter to *YES. Press Enter. 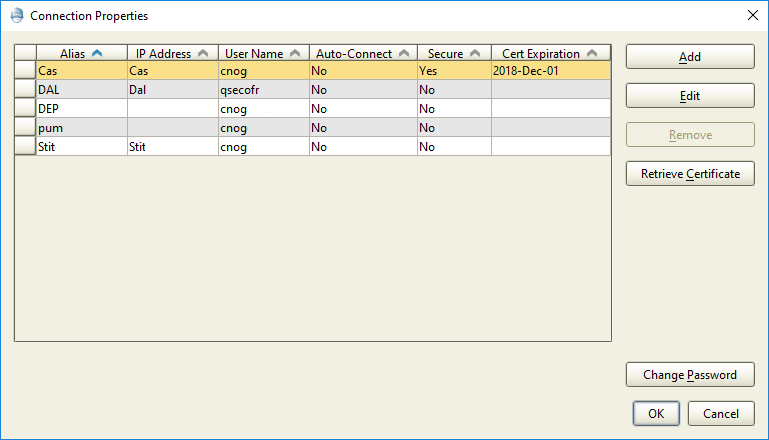 See the Connection Properties section of the Robot Console User Guide. See the Connection Properties section of the Robot Schedule User Guide. See the Connection Properties section of the Robot Space User Guide. See the Defining Host Connections section of the Robot Network User Guide.